Join us as we honor important fighters for the cause of immigrant and worker’s justice! Les queremos hacer una cordial invitación para apoyar al Centro de Jornaleros y nuestra labor al reconocer a individos y organizaciones que han sido instrumental en la lucha durante este año. 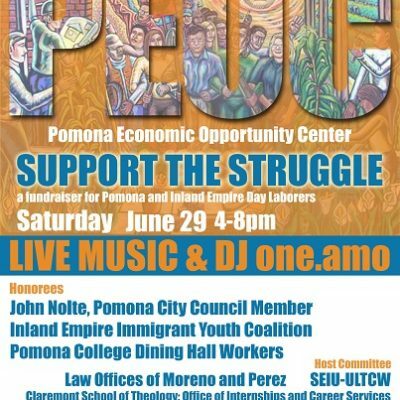 Tendremos una cena para reconocer a John Nolte, ex-presidente de la mesa directiva del Centro y actual concejal de Pomona, a la Coalición de Jóvenes Inmigrantes (IE-IYC), y a los trabajadores del comedor de Pomona College, quienesacaban de formar un sindicato después de años de lucha. Boletos de pre-venta cuestan $40 por plato con el precio de la puerta a $50. Habrá rica comida mexicana y entretenimiento. You are invited to support the PEOC as we honor individuals and organizations that have been crucial to the struggle during this year. 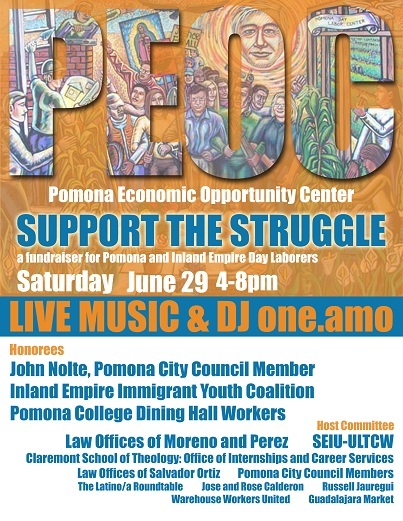 We will hold a dinner to recognize John Nolte, former president of the PEOC board of directors and current member of the Pomona city council, the IE Immigrant Youth Coalition, and the Pomona College dining hall workers, who have just formed a union after years of effort. Presale tickets cost $40 per plate, while the price at the door will be $50. Delicious Mexican food will be served and entertainment will be provided. For tickets, please contact the center or make a donation via the website, making note that the funds are for the dinner.